Take your seat aboard an air-conditioned tour bus departing at 8:15 a.m. from our office located in the center of Paris. You’ll be driven to the Fondation Claude Monet, where you can visit the garden at Giverny and Monet’s home at your own leisure. See Giverny at your own pace, starting with Monet’s home. There, you will learn about the life of the artist, who lived there until his death at the age of 43. You can appreciate the reading room, also called the “blue room,” the sunflower-yellow dining room adorned with Japanese prints, and the private apartments. Continue your visit in Monet’s studio, today a gift shop where you can find a variety of souvenirs. Next, turn on your audio guide for commentary as you visit Monet’s garden. Amble through flower-lined paths that inspired the artist’s impressionist paintings. Revel in the lavish, multicolored flower beds. Step into the Clos-Normand, home to many Far Eastern plants and vegetation. Cross the water garden by the Japanese bridge. Peer over the edge to see its famous water lilies, found in the celebrated painting of the same name. Take your time as you experience Monet’s universe in an exotic, ethereal atmosphere. Next, climb aboard your bus. It will take you to the Moulin de Fourges restaurant 10 minutes from Giverny, where you will be served a lunch that includes traditional Normand fare. After the meal, it’s off to the Palace of Versailles. 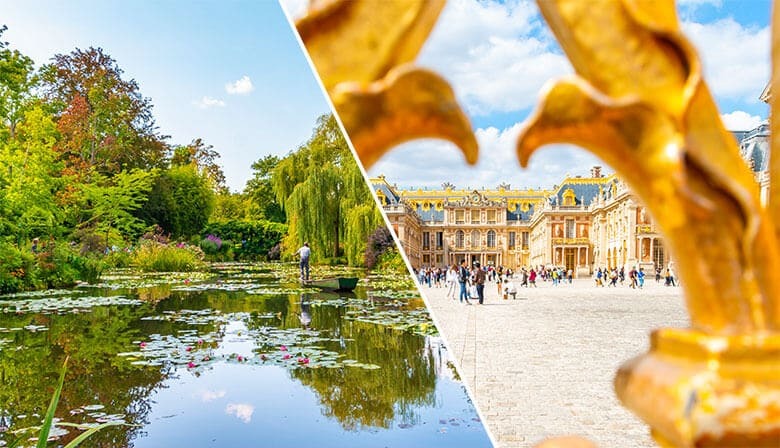 Priority access lets you get the most out of your Versailles visit. Your audio guide will point you in the right direction as you discover the King’s chambers. You will enter seven rooms, each decorated in the style of a God. Next, enter the magnificent Hall of Mirrors, where guests were invited during celebrations. The hall overlooks Versailles gardens. Admire the emblem of the Sun King, Louis XIV, one of the most ornate symbols to represent 17th century French art. If it is not the season for the Musical Fountains Show and Musical Gardens, you can take time to explore the gardens, where statues, sculptures, fountains, flowerbeds, coppices and reflecting pools are all aligned. Under Louis XIV, André le Nôtre designed the Palace’s gardens, endowing them with unique, grandiose proportions. You will depart Versailles around 5:00 p.m., reaching our office in Paris at about 5:45 p.m. I love this tour because in one day you can visit 2 beautiful places with wonderful gardens. Lunch time is also a good moment in a charming mill in the middle of the campaign. Everything is perfectly organised and you don't lose your time if you only have few days in Paris ! I like that the tour wasn’t a lot of people and still Have us enough time to see everything. This tour met all of my expectations. Our tour guide Marie was very friendly, helpful and personable. She made us feel comfortable on the trip and helped give a few suggestions of other highlights to visit in Paris. We would definitely go on a tour with this company again! Loved the pen that you could point to a spot on the brochure and here the audio. Lilliana was very kind and helpful. Enjoyed very much the lunch at a beautiful restaurant with a water wheel. Excellent food and wine. Fantastic tour and lunch was wonderful. Our tour Guide Alessandro made sure we got into everything quickly and he explained everything very well so we wouldn’t get lost. Merci beaucoup! The audio guided tour was good. We expected it to be a guide who spoke into the audio, but it was a scripted pre recorded audio . I liked the coach transportation. The location of lunch was fabulous, but the tables should be of maximum 6 people. 10 per round table is like a wedding and it’s too hard to talk to anyone other than who is besides you. Versailles was nice, but since we had the audio guided tour we had to wait a long time to enter whereas the rest of our bus went in ahead of us. The tour guides were nice and spoke English. Will use this service again.